Rosacea is a genetic-based inflammatory skin disorder that affect the face, eyes and scalp. Clinical studies have found five major disturbances in Rosacea - Blood vessels, Skin, Local Immune Cell disturbances, Dilator Nerve Disturbances, Hormone Dilator Disturbances. Rosacea affects 16 million Americans and 20,000 new diagnoses are made each month. Rosacea symptoms include chronic facial redness (rosy cheeks, red nose, forehead redness and blotchiness around the chin — some can just have one area affected while others might have multiple affected areas). Rosacea sufferers actively flush from many triggers such as heat, psychological stress, sun, embarrassment, harsh skin care products, cold, wind, spicy foods, alcohol, caffeine, and spontaneous flushes due to changes in internal core temperature. Rosacea sufferers are unique and each has their different symptoms and triggers, but other common symptoms include tiny red bumps called papules, larger bumps with pus called pustules, broken blood vessels, hyper-sensitive skin, skin that burns or stings easily, skin growth (Rhinophyma like W.C. Fields), eye disturbances and scalp inflammation. Most Rosacea sufferers had normal skin up until their mid twenties and all of a sudden, they start breaking out (adult acne onset), noticing skin redness or blotchiness, and start flushing and blushing to various triggers. That is the core of Rosacea, but since most people do not know that they go undiagnosed for years. Rosacea Awareness month was started to inform people of what Rosacea is, what they should look for, and that they should get treatment as quickly as possible since it is a progressive and sometime debilitating condition. Since sun and heat are common triggers I wanted to address these symptoms during the summer when many people may be noticing their Rosacea symptoms becoming more pronounced. Flushing: periodic reddening of the face aggravated by various trigger factors, such as hot showers, emotional upset, alcohol, PMS, menopause, etc. What role do the Demodex mites and the bacteria living in their guts play in Rosacea? Demodex are not the main cause of Rosacea but contribute to the pathology of the disease. While not the ultimate cause, according to the National Rosacea Society, Demodex play a role in over 78% of cases. Human beings live amongst the bugs of the world, they are everywhere. We are surrounded by bugs in the world! Demodex folliculorum, a 0.3-mm long Acarus mite, is the most common ectoparasite in humans. Due to its ubiquitous nature, infestation with this organism is recognized as a normal occurrence. However, there have been numerous clinical observations linking the presence of Demodex mites at extremely high-density colonization with various skin disorders. Demodex mites have been suggested as the causative agent in Rosacea, perioral granulomatous dermatitis, blepharitis, and pustular folliculitis. Demodicidosis has been associated with AIDS and chemotherapy for malignant diseases. Everyone has at least 1 Demodex in each sebaceous gland. Demodex larvae, eggs, and adults can be a big part of the problem. Bacteria in the guts of the Demodex are also a problem. Demodex are transmitted from same species to each other-dog to dog, people to people and highly contagious through kissing, cheek to cheek, etc, hand to eyes from you to others, soap bar, same shampoo, can live up to 72 hours outside the body. Clothes and shirts over the head, hats…. all are transmitters. Demodectic mange is not contagious between dogs and humans. If it looks like your other dog is getting the same thing then your puppy may have Sarcoptic mange which is contagious, to dogs and to humans (it will appear as a rash on humans). Normal people can block their entry into the skin, the immune system zaps them. Rosacea sufferers have a hard time blocking their entry into the skin because their inflamed skin causes suppression of their host defenses (e.g. immune system). In recent years there have been major grants by the National Rosacea Society known globally as the best non-profit society to advance research and treatment modalities to study Demodex. Inflamed skin suppresses the immune system so the Rosacea sufferer cannot fight them off. It is the perfect environment - hot, sweaty, sebum and a lot of blood flow. Over 160 peer reviewed article on Demodex since the late 70’s on Demodex and Rosacea face, eyes, and scalp. For the first 20 years no one knew the role Demodex plays. In the last several years there have been over 50 more superb clinical papers that have helped clarify Demodex role in Rosacea pathogenesis and progression due to the new non-invasive research equipment…. over the last four years biopsies on thousands of Rosacea sufferers and controls (non-Rosacea sufferers) show that 89% of Rosacea sufferers have pathogenic numbers of Demodex (greater than 5 Demodex per sebaceous glands) while controls have pathogenic numbers in less than 10% of those tested. In fact, clinical studies show that Rosacea sufferers can have more than 100 Demodex in a single sebaceous gland! There can be over 120-150 in each gland! Demodex are active with stress, sun, harsh skincare products, heat, warm spicy foods which are triggers for a flare. Demodex trigger flushing and redness through the action of increased blood flow, and damage blood vessels, induces an inflammatory immune response with free radicals which further damages sebaceous gland and blood vessel right underneath the skin. Demodex adults, larvae and eggs live in the bottom of the sebaceous gland lobules, when they come out of the glands, their effective pincers eat the sebum and create lipase which is an irritant and they can produce inflammatory chemicals like cytokines-key to facial, ocular, and scalp Rosacea. (Scalp Rosacea symptoms consist of chronic redness, burning sensations, cystic pustules and papules, hair loss). The lobules look like cauliflower in the sebaceous gland histology, in normal skin there is only one Demodex mite, but in Rosacea skin it is like a balloon of Demodex mites at the end of the lobule. The pincers chew on the sebaceous gland to get out and promote inflammatory reactions. They go out at night and go into other sebaceous glands. Demodex are active at night; people feel an itchy, crawly feeling as the Demodex go from one sebaceous gland to another. When Demodex become overpopulated and move at night, they trigger an increase in blood flow by 150-300%, partly causing inflammatory and vascular redness. The redness from an acne breakout is from inflammation not blood flow. Demodex larvae feeds off the sebum, waste product is lipase, inflammatory, as well as cytokines. Chemokines are responsible for the immune response reaction- they send out dozen different signals to tell the local facial immune system that something is wrong and the immune system sends out macrophages, neutrophils, (release oxidative bursts of free radicals that kill everything), and Leukotrienes. This causes mast cell reactions-mast cells contain 1-part histamine and 12-parts Leukotrienes. Your body’s response is erroneous and is bad for you. How does Rosacea affect ocular health? Under each eyelash-30 on top and bottom usually- is a Meibomian oil gland, just like sebaceous but in the eyes. Each time you blink it squeezes out oil and it goes over the entire eye which protects the tear film layer. The top of the eyeball of the normal eye has thousands of goblet cells which secrete mucous that covers the surface of the eye. (Rosacea sufferers only have about 70-100 goblet cells) under this layer is water…. This is the coating of the eye. In Rosacea, the blood flows out of the side of the nose and goes to the eyelids and the ocular surface. Stress or trigger causes red eyes… and the classic butterfly flushing zone - called centrofacial flushing. In Meibomitis and blepharitis there is a release of inflammatory cytokines (Restasis blocks these). This decreases the oil gland to almost nothing. The gland cannot secrete oil and that kills and interferes with goblet cells and cause’s tears in the film covering (corneal) of the eye so they get dry eyes. If the tear film layer is abnormal - blurred vision, and scratchy dry eyes can result. This affects people’s ability to do their jobs - ocular Rosacea can cause people to be unable to work, due to blurred vision. It is common for Demodex to cause sties or chalacion (little round bump on the eyelid). How are Demodex mites treated in Rosacea? Ivermectin is the chemical name of a drug called Stromectol, an antihelminthic with a long safety track record. Ivermectin is a synthetic derivative of the antiparasitic class of compounds known as avermectins. Ivermectin has a structure similar to that of macrolide antibiotics, but without antibacterial activity. It is used against a wide range of endoparasites (nematodes) and ectoparasites (insects, acarine) of animals and humans. The interest of dermatologists in ivermectin therapy grew when promising results were observed in the treatment of human ectoparasites such as scabies. Ivermectin is of great interest in the treatment of patients with different forms of scabies, head lice, demodecidosis, cutaneous larva migrans, cutaneous larva currens, myiasis, and filariasis. Since the average adult dose has been 12mg which is repeated in one week, it would take 4 x 3mg Stromectol to do the job. 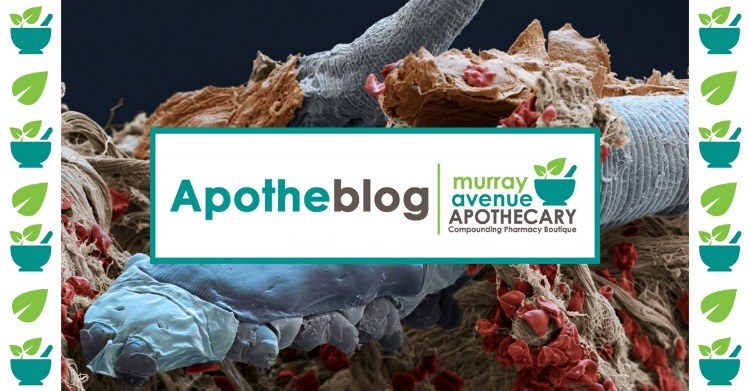 At Murray Avenue Apothecary we have created an enhanced Rx oral Ivermectin capsule which is hygroscopic, slow release, and has an absorption and bioavailability enhancement complex (phospholipids), and increased delivery of bioactive material to sebaceous glands. Our goal at the Apothecary is to treat the superficial inflammation quickly with a topical treatment and get deeper with oral treatment like Ivermectin. Diagnosis is usually made with a Potassium Hydroxide scraping or sebum tape test in a dermatologist’s office. The main action of these nutraceuticals is to sure up the stomach HCL defenses against Demodex bacteria, reduce facial inflammation, strengthen blood vessels, and also as a prevention against future damage to facial blood vessels. 1) Digestive Enzymes with Betaine - 1-2 tablets 15 min before each meal-cut back dose if burning occurs. 2) Wild Omega EC Omega-3 - Fish Oils 2 caps three time a day with food to strengthen the outer membrane of the cell and decrease inflammation OR Krill Oil 500mg – 2 capsules daily. 3) Evening Primrose GLA - 1 cap per day with food. 4) Probiotics 30 BU -1 twice a day on an empty stomach at bedtime and upon rising. 6) Grape Seed Extract - a powerful antioxidant that strengthens blood vessels-use 150-300mg per day. 8) Inflammazyme - a proteolytic enzyme formula for inflammation - 3 capsules at bed, upon rising, and in the afternoon. 9) LabNaturals Mineral Sunscreen – a nonchemical sunscreen that can protect the skin from UVA and UVB rays which can trigger Rosacea symptoms. 5) OTC - Antioxidant Repair Treatment A superior antioxidant facial treatment cream that is gentle enough for sensitive damaged skin. May be used for skin that is dry, flaky, or sun-damaged. May also be used for Rosacea or laser-treated skin. 6) OTC - Rosacea II with Glutathione, Vitamin C, and Sulfur - a superior topical for inflammation, redness, and blood vessel strength. **Note-all of the above products may be purchased from Murray Avenue Apothecary in person or by calling 412-421-4996 for more information. Shipping is available. Bjerke R, Fyrand O, Graupe K. “Double-blind comparison of azelaic acid 20% cream and its vehicle in treatment of papulo-pustular rosacea.” Acta Dermato-Venereologica. 1999 Nov;79(6):456-9. Breneman d, et al. “Double-blind, randomized, vehicle-controlled clinical trial of once-daily benzoyl peroxide/clindamycin gel in the treatment of patients with moderate to severe rosacea.” International Journal of Dermatology. 2004 May;43(5):381-7. Culp B, Scheinfeld N. “Rosacea: a review.” Pharmacy & Therapeutics. 2009 Jan;34(1):38-45. Del Rosso JQ, et al. “Two randomized phase III clinical trials evaluating anti-inflammatory dose doxycycline (40-mg doxycycline, USP capsules) administered once daily for treatment of rosacea.” Journal of the American Academy of Dermatology. 2007 May;56(5):791-802. Fivenson DP. “The mechanisms of action of nicotinamide and zinc in inflammatory skin disease.” Cutis. Jan;77(1 Suppl):5-10. GuptaAK, Gover MD. “Azelaic acid (15% gel) in the treatment of acne rosacea.” International Journal of Dermatology. 2007 May;46(5):533-8. HelmTN, Schechter J. “Biopsy may help identify early pyoderma faciale (rosacea fulminans).” Cutis. 2006 Apr;77(4):225-7. Hoting E, Paul E, Plewig G. “Treatment of rosacea with isotretinoin.” International Journal of Dermatology. 2007 May;46(5):533-8. Jansen T, Plewig G, Kligman AM. “Diagnosis and treatment of rosacea fulminans.” Dermatology. 1994;188(4):251-4. Kapes, Beth. “P. acnes possible factor in rosacea: BenzaClin a significant Tx in lesion reduction.” Dermatology Times. 1 Apr. 2003. Kendall SN. “Remission of rosacea induced by reduction of gut transit time.” Clinical and Experimental Dermatology. 2004 May:29(3):297-9. Liu RH, et al. “Azelaic acid in the treatment of papulopustular rosacea: a systematic review of randomized controlled trials.” Archives of Dermatology. 2006 Aug;142(8):1047-52. Montes LF, et al. “Topical treatment of acne rosacea with benzoyl peroxide acetone gel.” Cutis. 1983 Aug;32(2):185-90. NirenNM, et al. “The Nicomide Improvement in Clinical Outcomes Study (NICOS): results of an 8-week trial.” Cutis. 2006 Jan;77(1 Suppl):17-28. Parodi A, et al. “Small intestinal bacterial overgrowth in rosacea: clinical effectiveness of its eradication.” Clinical Gastroenterology and Hepatology. 2008 Jul;6(7):759-64. Epub 2008 May 5. Tan JK, et al. “Randomized placebo-controlled trial of metronidazole 1% cream with sunscreen SPF 15 in treatment of rosacea.” Journal of Cutaneous Medicine and Surgery. 2002 Nov-Dec;6(6):529-34. Torok HM, et al. “Combination sodium sulfacetamide 10% and sulfur 5% cream with sunscreens versus metronidazole 0.75% cream for rosacea.” Cutis. Jun;75(6):357-63. Forton F, Germaux MA, Brasseur T, De Liever A, Laporte M, Mathys C, Sass U, Stene JJ, Thibaut S, Tytgat M, Seys B.
J Am Acad Dermatol. 2005 Jan;52(1):74-87. A clinico-pathological approach to the classification of human demodicosis. Akilov OE, Butov YS, Mumcuoglu KY.
J Dtsch Dermatol Ges. 2005 Aug;3(8):607-14. Could matrix metalloproteinase-9 be a link between Demodex folliculorum and rosacea? Demodex mites: Facts and controversies. Department of Dermatology, Geisinger Medical Center, 100 N Academy Ave, Danville, Danville, PA 17822-5206, USA. Clin Dermatol. 2010 September – October;28(5):502-504.